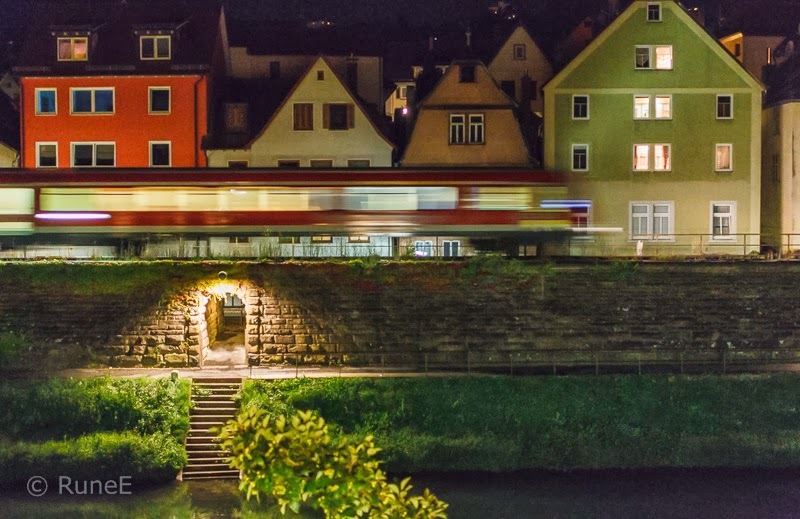 This is a Night Train in Wertheim. 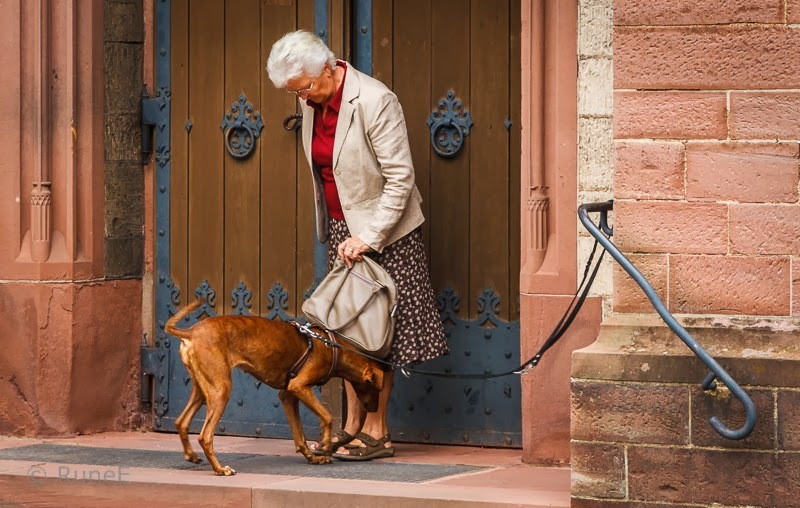 A dog greeting a lady outside the Cathedral in Tauberbischofsheim. 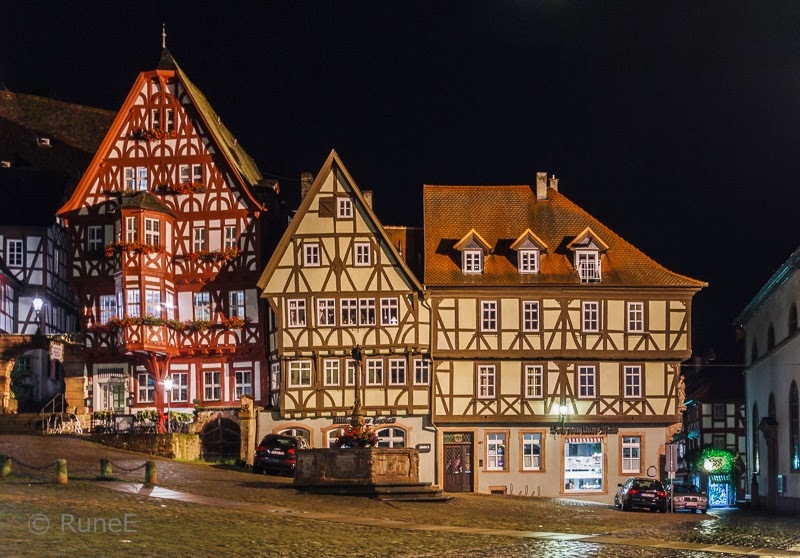 An evening after the rain in Miltenberg. 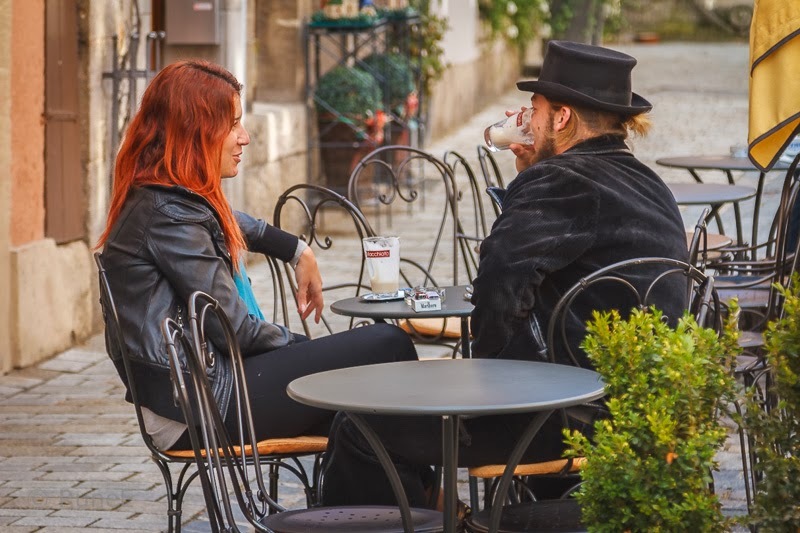 A colourful pair enjoying life in Rothenburg. Schloss Neuschwanstein in Schwangau. 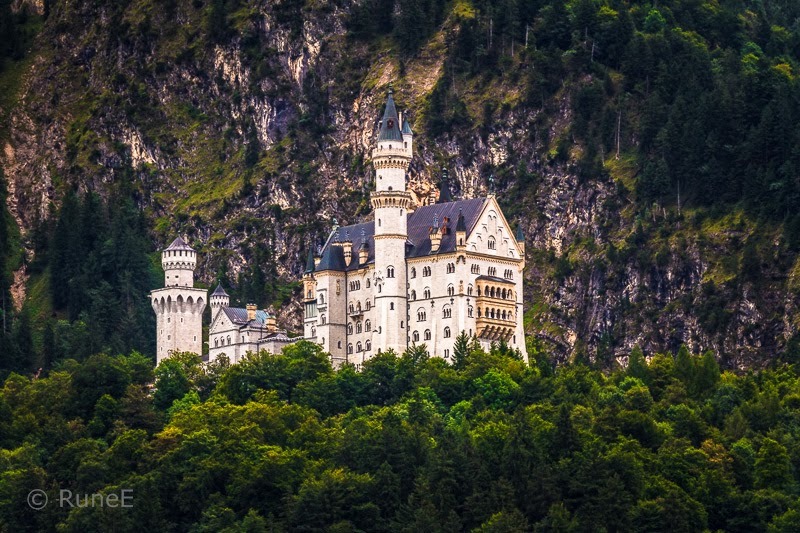 Built by King Ludwig II of Bavaria and copied by Walt Disney. So good to see you back online and what a wonderful trip you had, Rune!! Your captures are superb -- as always!! I spent 18 months in Germany many years ago and visited Neuschwanstein!! What an incredible place it is and your pic brought back lots of memories!! Thank you for sharing! Enjoy the remainder of your week!! So that's where you've been! Great photos as always but I am glad you said that was a train in the first photo.. So fast! Love the cute houses and the couple but wow Scloss Neuschwanstein! I had a poster of it on my bedroom wall when I was a teenager. Ser ut som dt var en herlig tur? Men melk i glassene i Tyskland nå med ølfestivaltid...Hmmm! Holy cow, I think those houses are trying to see just how German they can look! And what a good contrast the train makes to the solid, colorful, well-lit but stationary houses. Do you happen to know Wallace Stevens' poem, "The Disillusionment of Ten O'Clock"? It's not very cheerful compared to your first photo, but I see a connection. Maybe also a connection to Hopper's painting "Night Hawks" in the human attempt to make or find light and color against the night's darkness. MAYBE the couple relaxing is my favorite photo, but I like them all, as usual. Your photos always delight me. Very polished and professional; if you lived closer, I'd ask you for lessons. Without that I'll just have to follow you around on the internet and enjoy your posts. I particularly like the third from the bottom...amazing facades on those buildings. I visited Neuschwanstein when my son was stationed in Germany with the Air Force. An amazing place for sure. I envy your talent(s) as a photographer....and the sights that you behold. But, I will enjoy both of those through your blog; I'm so happy to be here. Looks like a good photo 'safari'; I particularly like the shot of the 'colourful couple' - great hat. You have some delightful shots of Germany! Ludwig's castle is certainly an amazing work of architecture. Wonderful images to return with. I love Germany and your gorgeous shots. Compliments!!!! Your outtakes are fantastic...such exquisite detail as well as poignant moments. Thanks for the treat!!! Germany appears to be a magical place with storybook architecture, mountains and colour. "Blogg-ferier" må en kunne tillate seg .... artig at du deler litt av opplevelsene dine! Selv om jeg nettopp har kommet hjem fra en ferieuke, pirrer du reiselysten min! Really great photos my friend. Looks like you both had a great time there. We have just returned from 2 weeks in Scotland. You can see these photos on my Facebook page. It's really like a fairytale land. Wow! I love these photos!! I couldn't possibly pick a favourite because each is charming and unique in its own way. Nå hopper jeg og scroller litt her og der i bloggen din, lenge siden jeg har vært på besøk rundt om i bloggene..